My Celebration Church ladies pray for me. Fierce 2013 -- our Fall Breakaway for the AG women and teen girls here in Florida kicks off today! I'm the rep for the Tampa Bay area and even more than the privilege of serving on this great leadership team, I love being away with our church women and girls. There is nothing like being a "church mama," and I am one. :) Have been for 26 years. There is nothing that compares to investing in the lives of people and seeing changes in their hearts. 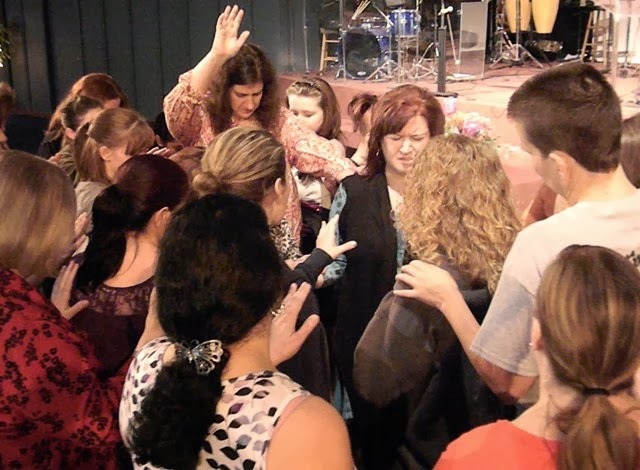 There is nothing I want more than to see our ladies and girls walk in the fullness of God. I'm ready for all that God has for us the next few days. Those of us on the leadership team have been here since 4 pm yesterday, setting up. There's so much amazingness in store for almost 1800 women and girls, they have NO idea! !